SAN FRANCISCO — Hunter Pence stepped into the cage during batting practice, put down a bunt, and then took two light swings. He felt pain in his right hamstring, and he shook his head at coaches and walked toward the clubhouse to get more treatment. Five hours later, Pence talked his way onto the field and walked off the Padres in one of the strangest ways possible. Pence drove in the only run Monday night and clinched a shutout for Johnny Cueto when he hit a towering two-out pop-up in the bottom of the ninth that dropped in front of charging right fielder Matt Kemp and kicked away far enough for Brandon Belt to race home from first. Pence flashed a wide smile as he eased into second base. The dugout exploded. Cueto, who was looking at a brutal no-decision, tumbled over the rail to celebrate his third complete game in three starts against the Padres this season. It’s rare that a starting pitcher isn’t on the field at the end of his own complete game, but Cueto didn’t mind. His teammates were thrilled they were able to reward a newcomer who has given the Giants an absolute ace in the No. 2 slot in the rotation. 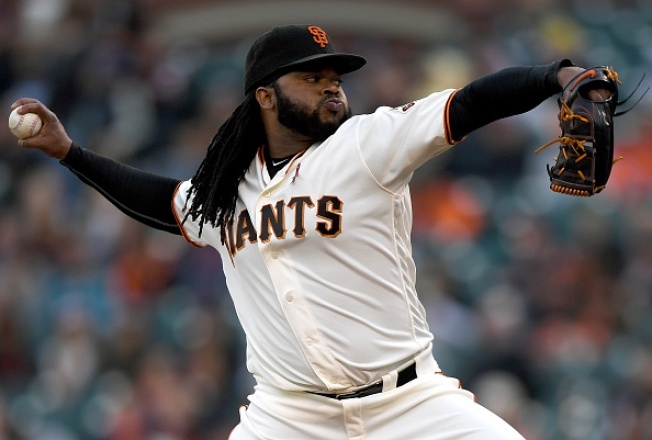 Cueto is the first Giant to win seven of his first 10 starts since Jason Schmidt in 2004. He’s the first since Atlee Hammaker in 1983 to threw three complete games against one opponent. He gave the Giants back-to-back 1-0 wins for the first time in 36 years. Pence, his right leg wrapped in ice, listed off a series of positives when asked about Cueto: Spirited, competitive, fun, has a good attitude, knowledgable. “His results have been remarkable, as advertised,” Pence said. Long before his mad dash home, Belt found himself standing at first and remembering how much he used to hate facing Cueto when he was in Cincinnati.